Slide milling has become very popular. It does not just make the gun look great but has functional purposes too. 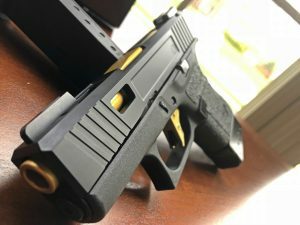 The popularity of red dot, RMR style sights for handguns, and a desire to customize a boring design created a demand in the firearms industry. Mainly slide customization using CNC tooling machines. Primary Machine is a company trying to set itself apart in a competitive industry completing their work in-house and leveraging the 3 CNC mills and CNC lathe to get the customer back their slide quicker than other companies. If you're like me and know very little about CNC machining and tooling, don't worry. Bruce Gageneaux, one of the big wigs over at Primary Machine will be on our Concealed Carry Podcast May 5th. And just like all our episodes, you will be able to interact live as we stream via Facebook Live. Go to the Concealed Carry.com Facebook page at 1 PM EST on the 5th and find out all about their process! But here is the basic gist of slide-milling. Your slide is placed in a high tech, computer controlled machine. The machine uses specially treated tools to remove and re-contour your slide. The end result is a completely different looking slide. As part of the machining process, bare metal on the slide is exposed. So the slide is Cerakoted or given a black nitride finish. 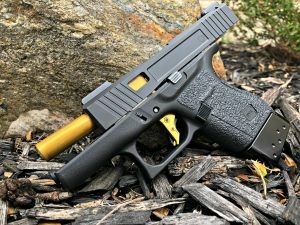 Primary Machine offers a number of solid Cerakote colors or combinations and patterns that, when paired with the mill cut, drastically change the appearance of the gun. As you can see in the photos, the gun looks amazing. But there are additional benefits to having your slide expertly milled that go beyond its killer looks. Removing mass from the slide allows it to reciprocate faster. Slide Milling, What's the Big Deal? Let's start with the concept of slide lightening. The main idea is to reduce the moving mass of your slide. A lighter slide will cycle more quickly, allowing for quicker follow-up shots. This sounds like a great idea, but there is a potential downside. Removing too much material from the slide, or removing it from vital areas can weaken and break the slide. What does Primary Machine say about this? The fact of the matter is out of thousands of slides we have milled, only ONE has cracked. It was a prototype slide of a new cut. We addressed the issue, and that cut has now been done on hundreds of slides now with zero reports of issues. There are a lot of companies doing this type of work, but I felt better knowing that Primary Machine has a solid track record with their milling packages. In fact, albeit a small sample size, I have now put 250 rounds through my Glock 43 with their UCC V3 Cut, without any sign of problems. Primary Machine's work produces a perfect surface free of tool marks. Another benefit of slide milling is to properly fit an optic to your handgun. Many may not know this but those RMR style optics that have become so popular on handguns need to be ‘fitted' to your gun by creating a ‘notch' for it to mount to the slide. I say ‘properly' that way because there is a method to attach optics by using an adapter of sorts that uses the dovetail notch of the rear sight. The milling option is the ‘proper' way because it attaches the optic securely to the slide. When using the other method, the points that secure the optic to the slide can be compromised and weakened during the constant impact as the slide reciprocates. When milling for an optic there are some things to consider. Most important, what type of optic are you going to use? Primary Machine not only will mill for the most popular optics available for Burris Fastfire III, Leupold Deltapoint Pro, Shield RMS, Trijicon RMR, Vortex Venom/Viper but will mill to accommodate your iron sights to be used as backups. Simply milling the slide to accept the optic is not as simple as it sounds. The points where the optic mounts to the slide undergo stress due to the cycling of the slide. To ensure no problems develop down the road, they make their cuts different. This diagram from their web page shows how. The way Primary Machine makes their optic cuts helps in ensuring the optic is secure and will remain secure even after heavy use. With all the companies out there to choose from when looking for slide work, I chose Primary Machine for a couple reasons. They have a great reputation in the industry. You will be hard-pressed to find a customer with a negative experience with Primary Machine's customer service. Their packages look appealing and are very innovative. Their work is flawless. No milling marks or lines at all. They will strip your slide and reassemble it for free. Some other companies will charge if you send them an assembled slide. Send in your new sights with your slide and they will install them for free. Fast turn around time. If you send your slide in for mill and Cerakote work you will receive it back in 2-3 weeks. They offer 50/50 plans which are similar to a layaway plan. Competitive pricing for quality work. Now I know I mentioned Glock throughout this article, but don't fret. 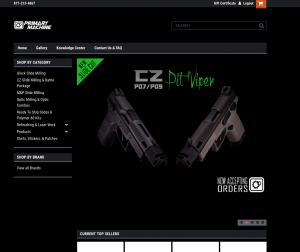 They offer slide cut packages for M&P's and CZ's. 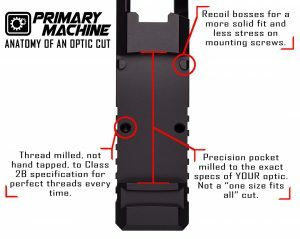 Primary Machine is innovative with their slide cut packages for Glock, M&P and CZ firearms. 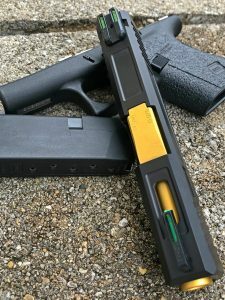 Primary Machine's webpage is very informative and you can check out some of their other products like suppressors for your handgun, match barrels and cool swag items. What’s The Deal With .357 SIG? Is It Dead?